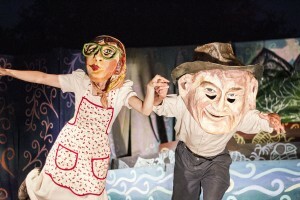 This production was presented Aug. 24 & 25, 2012 at Tina Chorvas Waterfront Park in Saugerties, NY. Bart Friedman’s three-part video of the show can be viewed at these links: Part 1, Part 2, Part 3. ~ From the Esopus Creek, which gathers its branches on the eastern Catskills and cuts across 400 million years of geology before tumbling into Hudson Estuary tidewater. ~ From Henry Barclay and Catherine Barclay, essentially the founders of the Village of Saugerties. Henry was a 19th century industrialist, inspired by Enlightenment ideas of science and human progress. He built a dam and an elaborate system of water channels to harness the energy of the Esopus Creek. Catherine was his partner and a force in her own right. ~ From the ruins of the Sheffield Paper Mill that lie in the trees next to this park. ~ From Cornelius Aloysius “Connie” Lynch, and Madeline Hill Lynch, the original proprietors of Lynch’s Marina, located just downstream from this park. Madeline was a sturdy, clear-headed woman, and a trained nurse. Connie was a stonemason and professional trainer of firefighters. The C. A. Lynch Fire Company, just up the hill, bears his name. Connie was also a storyteller. His anecdotes, word plays and archival memories wove and spun through two centuries of Saugerties history. UNDER MILL WHEELS is part of Arm-of-the-Sea’s Stories From Here, a community arts residency project which seeks to creatively involve area residents in local history and culture. As part of this project we will be working in several Saugerties schools this year. All proceeds from the SUITE will go towards the Stories From Here project. Story by Patrick Wadden with additional script and lyrics by Bob Lavaggi & Sarah Underhill. Mask Characters and Set by Marlena Marallo. Music by Dean Jones, Malcolm Cecil, Doug Elliot & Sarah Underhill. Voices by Bob Blacker, Sarah Underhill, Dean Jones & Doug Elliot. Workshop participants for millworker puppets: Grian McGregor, Sam Peck, Linda Montano, Jennifer Beard, Susan Murphy, Jo Anne Panke & Katie Fleissner. Saugerties Kiwanis Club, Klock Foundation, Ulster Savings Bank, Advanced Radiant Design, Lanny Walter – Attorney-at-Law, Kit Evers’-Our Book Shop, Stephen Dyott, Michaela Graham, Ulster Federal Credit Union, Adam’s Fairacre Farms, Central Hudson. And by public funds from the New York Council on the Arts, a state agency.